PARIS • Two reports have warned of an explosion in cancer deaths among women, with a toll, mainly from breast cancer, of some 5.5 million per year by 2030 - roughly the population of Denmark. This represented a near 60 per cent increase in less than two decades, said an analysis conducted by the American Cancer Society (ACS), released on Tuesday at the World Cancer Congress in France. "Most of the deaths occur in young and middle-aged adults", placing a heavy burden on families and national economies, said Ms Sally Cowal, senior vice-president of global health at the ACS, which compiled the report with pharmaceutical company Merck. A second report, published in The Lancet medical journal yesterday, said the number of women diagnosed with breast cancer alone could almost double to 3.2 million a year by 2030 from 1.7 million last year. For cervical cancer, the number of diagnoses could "rise by at least 25 per cent to over 700,000 by 2030," mainly in low- and middle-income countries, said a statement from The Lancet. Cancer kills one in seven women around the world - the second highest cause of death after cardiovascular disease - and will become even deadlier in the next decade, according to two new reports by the American Cancer Society and The Lancet journal. Here are the reports' main points. There were 6.7 million new cancer cases and 3.5 million deaths among women worldwide in 2012. The numbers are expected to increase to 9.9 million cases and 5.5 million deaths annually by 2030 as a result of the growth and ageing of the population. Breast and lung cancer are the two most common types in both rich and poor nations, with colorectal cancer the no. 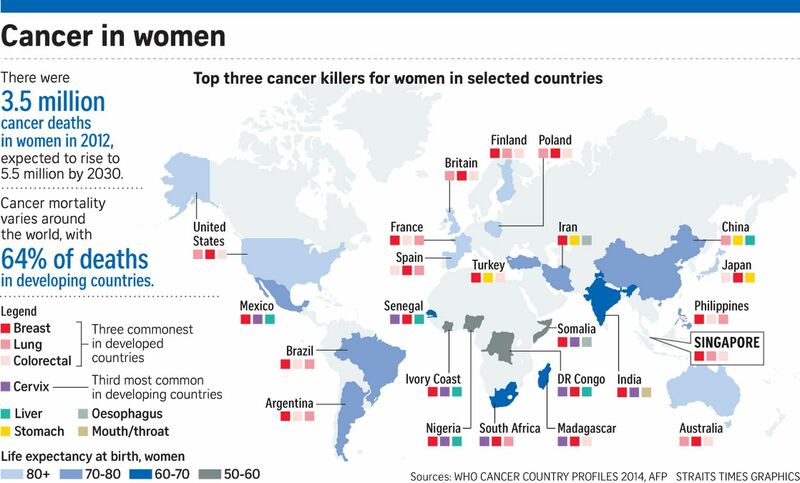 3 killer in developed countries and cervical cancer in less developed ones. In 2012, 56 per cent of new cancer cases and 64 per cent of deaths were in less developed countries. The countries with the highest death rate were Zimbabwe, Malawi, Kenya, Mongolia and Papua New Guinea. Women in developing countries are also increasingly exposed to known cancer risk factors "associated with rapid economic transition", said Ms Cowal, "such as physical inactivity, unhealthy diet, obesity and reproductive factors" such as postponing motherhood. "Due to these changes, cancers that were once common only in high-income countries are becoming more prevalent," said the report entitled The Global Burden of Cancer in Women. The highest ratio of cancer cases per population group is still reported in high-income countries in Europe, the Americas and Asia, but this was partly due to better access to screening and detection. Deaths, however, were proportionally much higher in low- and middle-income countries with reduced access to diagnosis and treatment. Yet, all four of the deadliest cancers - breast, colorectal, lung and cervical cancer - are mostly preventable or can be detected early, when treatment is more successful. Cervical cancer can be staved off by vaccination against the cancer-causing human papillomavirus (HPV) and can be easily detected through regular Pap tests. The Lancet report, comprised of three research papers, said a basic cancer control package could be introduced in low- and middle-income countries for as little as US$1.72 (S$2.40) per person - the equivalent of just 3 per cent of current health spending in these countries. Universal HPV vaccination of all 12-year-old girls could prevent 420,000 deaths worldwide over their lifetime. "The global community cannot continue to ignore the problem - hundreds of thousands of women are dying unnecessarily every year," said Professor Richard Sullivan of King's College London, who co-authored The Lancet report. "Not only are the costs of essential cancer services for women lower than expected, but scale-up of diagnostic, surgical and treatment services is a highly effective investment compared with the devastating economic cost to countries, communities and families."